1. Will my cartridge fit in the printer? 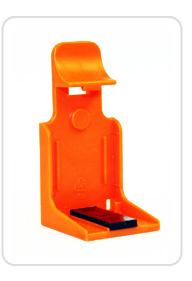 ALL cartridges supplied are 100% remanufactured using the OEM (Original Equipment Manufacturer) cartridge once empty e.g. HP, Canon, Brother, etc. Given that the OEM cartridge was produced to fit the corresponding printer, our remanufactured cartridge is guaranteed to also fit in the printer it was originally designed to be used in. 2. What should I do if my cartridge isn't printing correctly? Take a cotton bud and dampen with some warm water. Then gently wipe around the area of the print head at the base of the cartridge. Take a clean, dry paper kitchen towel and gently wipe the copper contact points at the back of the cartridge and the contacts inside the printer cartridge carrier. Install the cartridge into the printer. Run a cleaning cycle on your printer. 3. What should I do if an error message appears on my screen? Take a clean, dry paper kitchen towel and gently wipe the copper contact points at the back of the cartridge and the contacts inside the printer cartridge carriage to ensure that the electronic contacts are not hindered. Unplug the printer from the power supply for approximately 1 minute to clear its memory. Reconnect the printer to the power supply. Run a cleaning cycle on your printer to ensure correct alignment for optimum print quality. Please remove the protective plastic clip only before you install the cartridge. 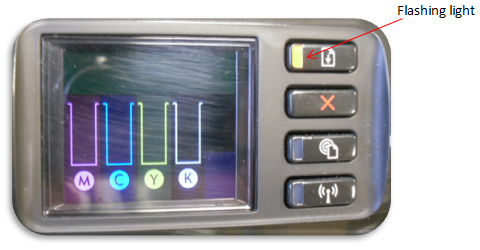 It is possible that the cartridge chip has not been connected properly with the printer's electrical contact. Press the OK button on the printer or remove the cartridge and reinsert it. Push firmly back into position to re-engage the chip/printer contacts. 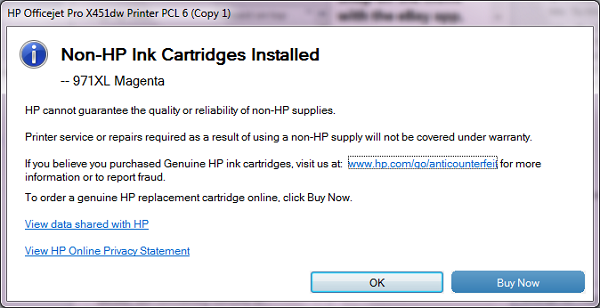 It is recommended to align newly installed cartridges from printer properties window. This is a remanufactured cartridge. The previous use of this cartridge has written "empty" to its memory. This is why after using it for a while a message appears that it is empty. Ignore this message by disabling the status monitor. If prompted to do so, press and hold the printer's stop/reset button for 5 seconds. Continue the printing process. The cartridge is running low of ink when the quality of the print-outs deteriorates. If there are lines, streaks or breaks on the paper when printing, perform a print head cleaning cycle. This can be located within the printer maintenance menu. Print a nozzle check to see if all the nozzles are free of blockages. If breaks still appear on the printed page, repeat the process. (Only perform up to two cleans). If print quality does not improve by standard Print Head Cleaning, try Print Head Deep Cleaning (Note that this process uses up valuable ink from the cartridge), which is a more powerful process, and perform a nozzle check once more. If there is still no improvement, perform another Print Head Deep Cleaning, 2 hours after turning off the printer. Do not unplug the printer. 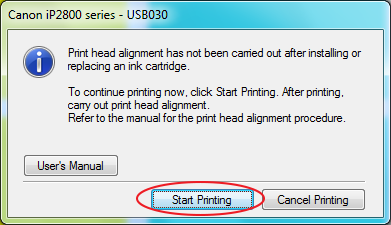 When the printer is not in use, the print head is automatically moved to the parked cartridge position. The print head should not dry out. For this reason, you should print or make test prints or print head cleanings on a regular basis (approximately every two weeks). For the same reason, remove the empty cartridge only when you have a replacement available. If the cartridge is removed from the printer, always re-use the clip provided to prevent ink from drying out and store it in a vertical position. 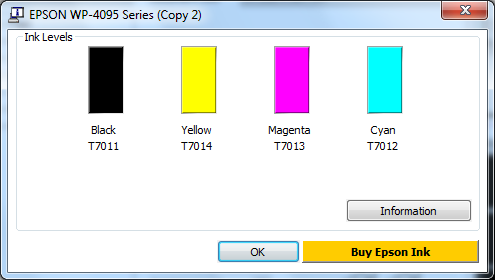 For optimum print quality, it is recommended to set the printer on Best Quality mode and select the suggested paper in the "Type" menu. 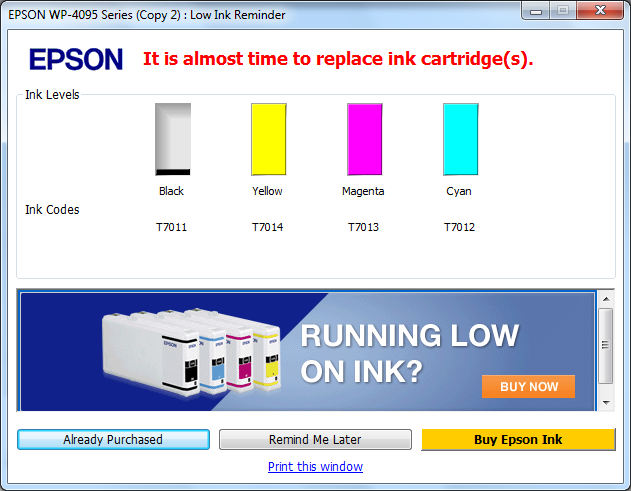 A warning message may appear indicating that the ink level is low and suggesting that the cartridge needs changing. Please just click "OK". 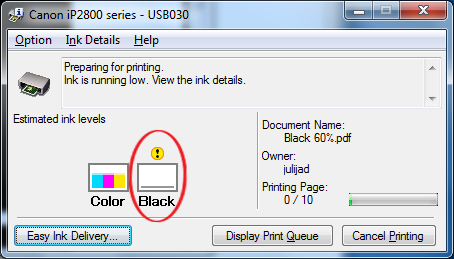 If the ink level indicator appears, ignore the message by closing the dialog box and continue printing, the message usually only appears once. 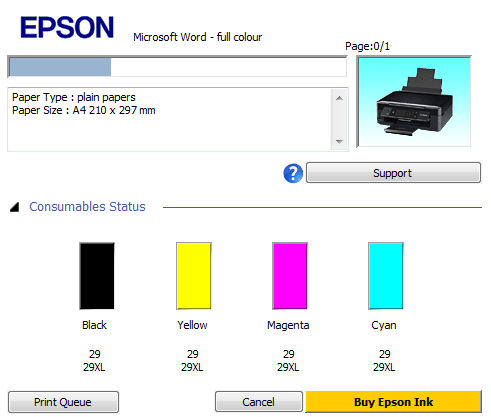 There is still some usable ink remaining in the cartridge and you can continue to print until it is actually empty, at this point the respective colour will have run out and the cartridge needs replacing. 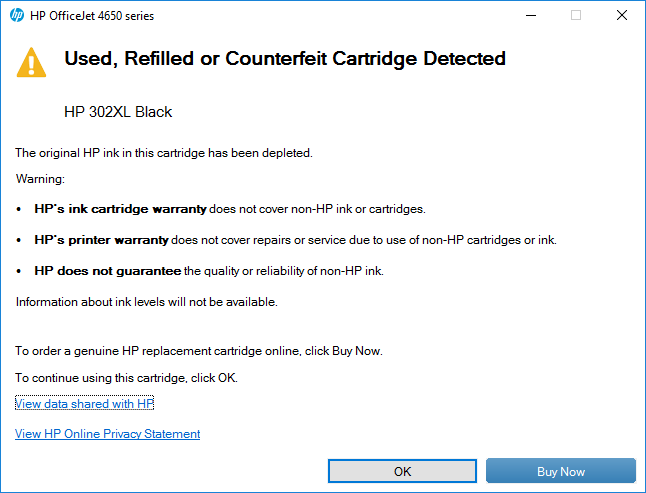 A warning message may appear indicating that the ink cartridge is empty or that it is a non original cartridge (this message may vary depending on the printer model). Just click "OK". If the ink level indicator appears, just ignore it. The status shown is not the status of the cartridge you just inserted; tick the box "do not display this message again" and close the window. Upon installing a new cartridge, a warning message like the one below indicating the cartridge and/or the ink levels cannot be detected may appear. If this message appears you can ignore it and proceed to click Continue. Note this message may vary depending on the printer model. On occasion the message will continue to appear each time you try and print a document. 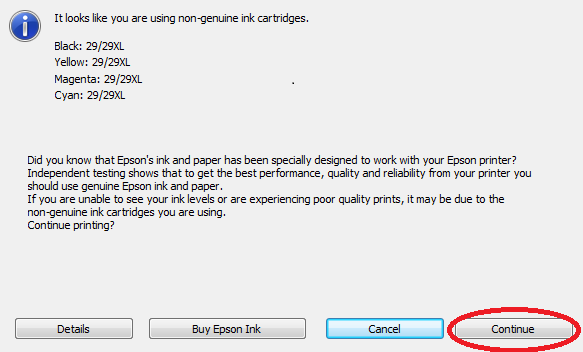 To disable this alert message, follow these steps to turn off the option in the Epson Status Monitor Utility. Open the printer control panel by clicking START, then under SETTINGS, select Printers and Faxes. 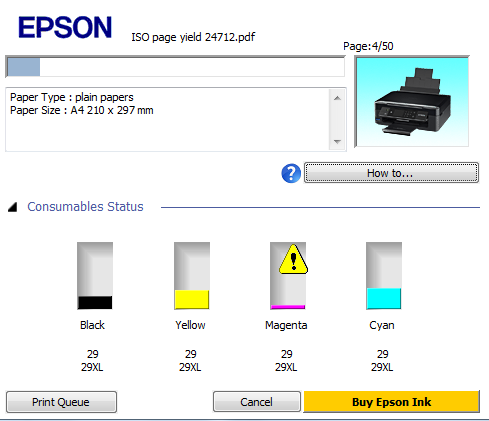 Then open the control panel for your Epson printer by double-clicking the name of the printer you have installed. 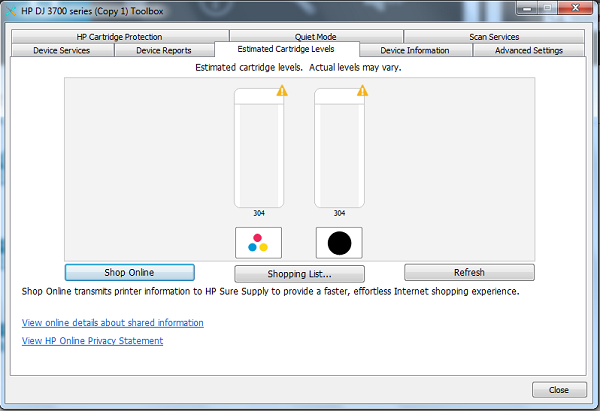 On the dialog box that opens click on the Printer menu and choose Printer Preferences. Then select the Maintenance tab as shown below. 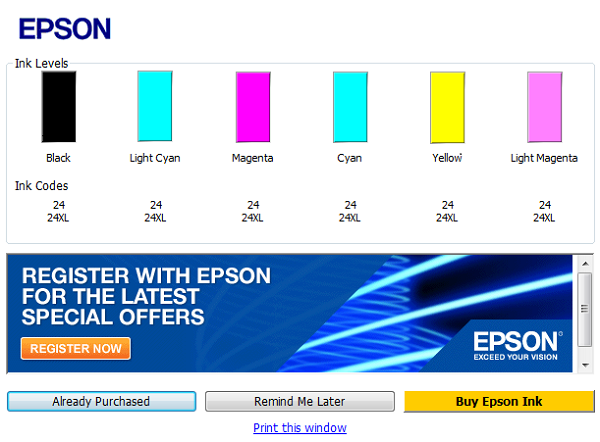 Finally check the option "Disable EPSON Status Monitor 3" and click OK to apply the changes. Proceed to click OK to close any other dialog boxes open. Note. 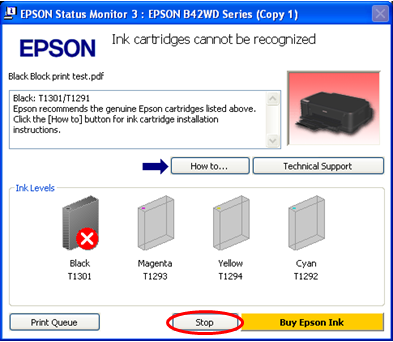 Should you wish to re-enable this utility just follow the steps above and uncheck the option "Disable EPSON Status Monitor 3". Upon installing a new cartridge, a warning message like the one below may appear. If you see this message after installation, it means the copper contact points on the chip may need cleaning. Take a clean, soft damp cloth or tissue and gently wipe the copper points on the chip. 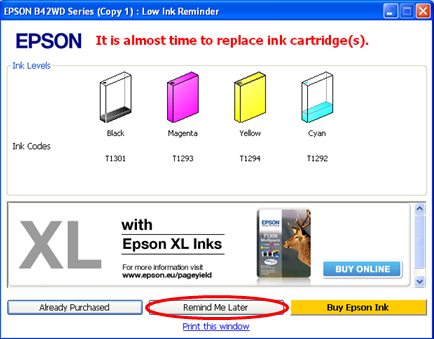 Allow to dry for a few seconds and re-insert the cartridge into the printer. On some printer models the firmware installed in the printers, which recognizes the non OEM cartridge, prompts this message when the cartridge is empty and needs to be replaced. 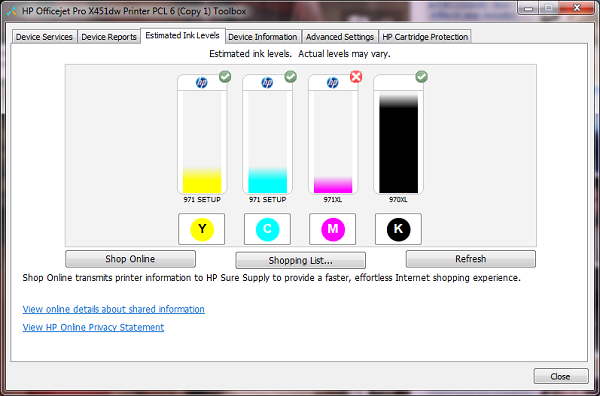 Upon installing a new cartridge, the ink level indicator may appear as shown below. In this event, please ignore it as it does not show the true status of the cartridge. 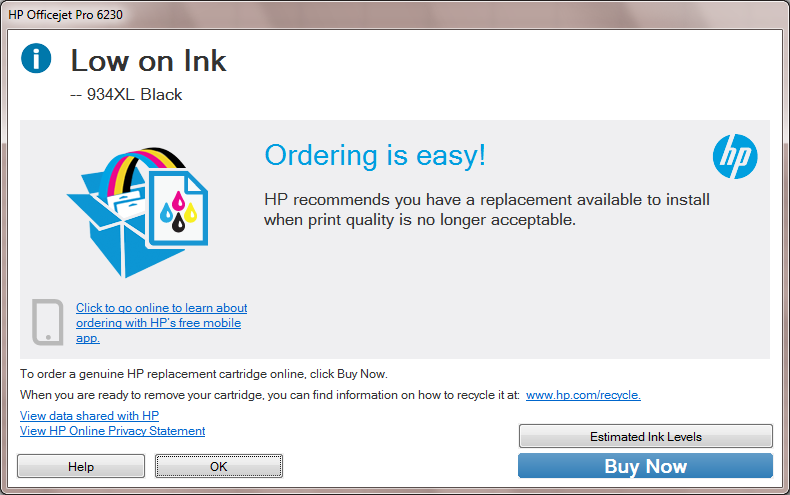 A warning message may appear indicating that the ink cartridge is empty. Simply follow the instructions on the screen to disable the ink level indicator (this message may vary depending on the printer model). By holding down the RESUME button for 5 seconds, the function for detecting the remaining ink will be disabled. If you have bought the Canon PG-512 or a CL-513 you might get a message that shows that you have installed a PG-510 or a CL-511 instead. If you have bought the Canon PG-512 or a CL-513 you might get a message that shows that you have installed a PG-510 or a CL-511 instead. 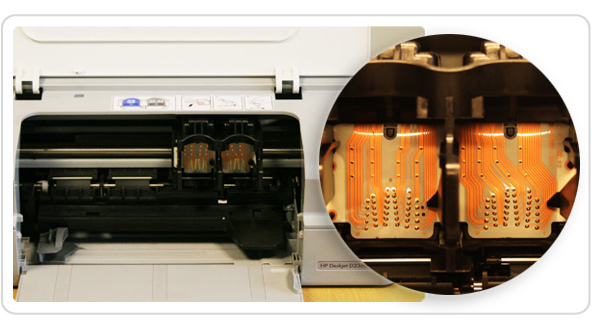 The circuitry of the cartridge is still PG-510 or CL-511but it has been through a special remanufacturing method that will allow us to maximize the amount of ink filled so you to get the same page yield as with a PG-512 or a CL-513 OEM respectively. Please follow the instructions on the screen to carry on printing. After installing a new cartridge, a warning message may appear as shown below. (please note that this message may vary depending on your printer model). Please click "OK" to dismiss this message and continue printing. 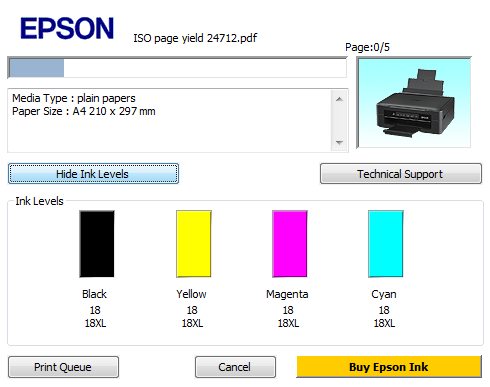 As the ink level is not monitored by the printer we recommend you check the printouts. If the ink appears to be fading consistently on the printouts, you should replace your ink cartridge. 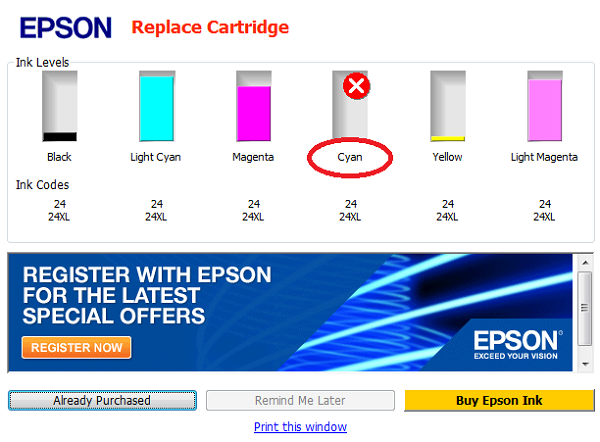 Please refrain from printing with an empty cartridge. 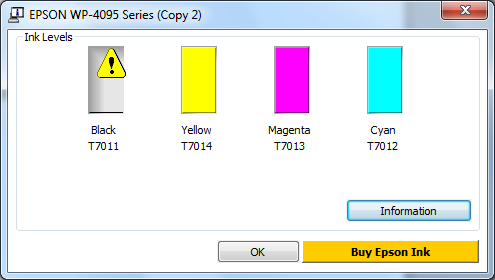 After installing the printer cartridge, a warning message may appear on the computer screen and/or the printer, as shown below (please note that this message may vary depending on the printer model). When any of the below messages appear on screen for a PG-540 or CL-541 cartridge, please press and hold the printer’s Stop button for 5 seconds. 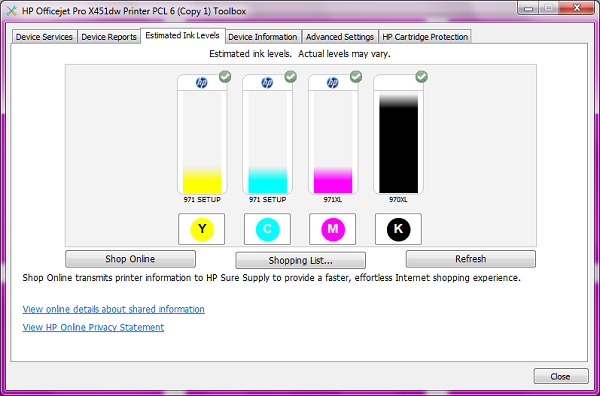 This will disable ink level indicator for the mentioned catridge and the printer would resume printing. 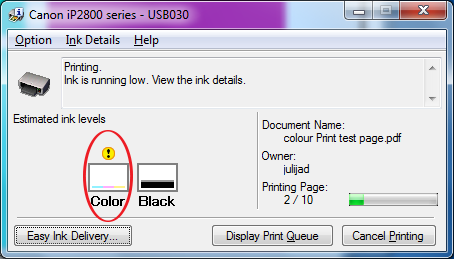 It is very important to note that the ink level indicator on the printer (if it has one) as well as the one in the printer driver on screen, does not show the correct level of ink in the cartridge. Therefore if the below message appears on screen, please ignore it and keep using the cartridge until it has been physically depleted. On installing an new EBP T1301 cartridge, the following message will appear on screen. The user should click the ‘Continue’ button, circled in red above. 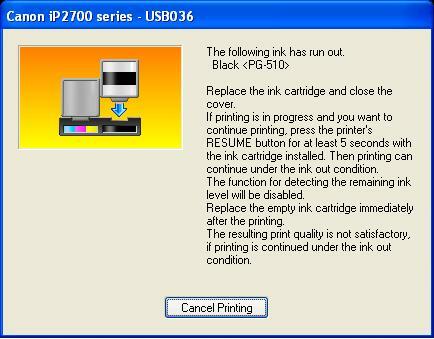 On dismissing this message, or when a print job is sent to the printer, the following popup will appear showing the black cartridge full. 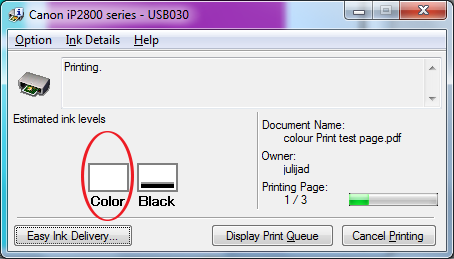 If the ink levels are not shown as per the above, the user would need to click the ‘Show Ink Levels’ button, circled in red. Please note, the text on the button here says ‘Hide Ink Levels’ because the ink levels are not hidden. This same button will change to ‘Show Ink Levels’ when they are hidden. As the cartridge is depleted, and the ink level is running low, the below message will appear on screen. 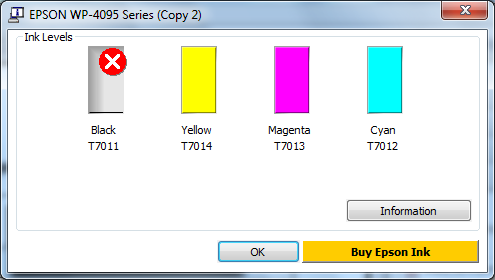 The user should click ‘Remind Me Later’ and continue with the printing, until the following message is displayed. At this point the user should click the ‘Stop’ button and replace the depleted cartridge. The black in this case. On inserting an EBP HP932 or HP933 XL cartridge, the user may be presented with any of the following messages on screen. The user should dismiss any of these messages by clicking ‘OK’ or ‘No’. Please see circled in red above. 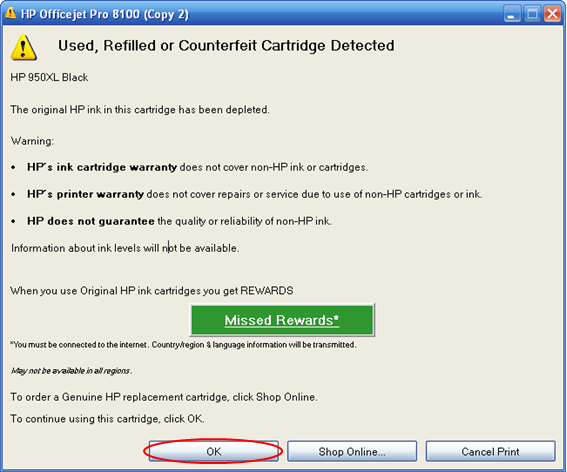 On dismissing the ‘Used or Counterfeit Cartridge Detected’ message (please see above), the following message will appear on screen. Same as before this message should be dismissed by clicking the ‘OK’ button. 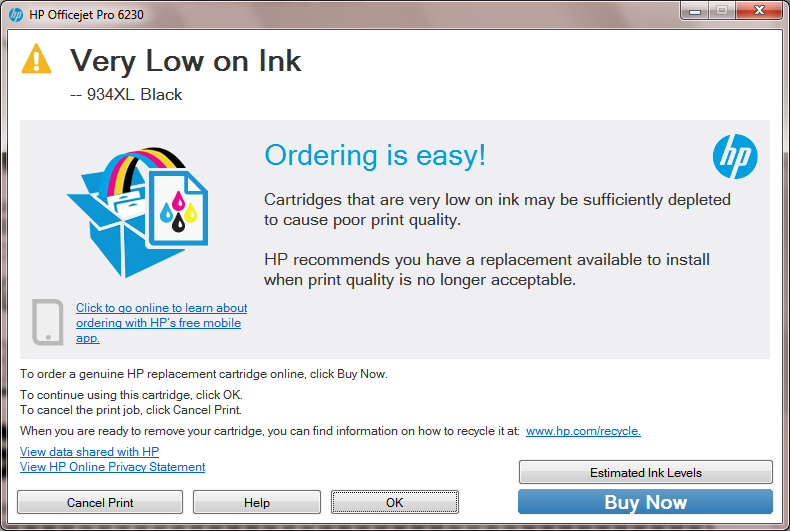 At any stage during the life of the cartridge, a ‘Low on Ink’ message may appear on screen. Please see below. This should also be dismissed by clicking ‘OK’, and the user should continue with the printing until the cartridge is physically empty. Which is when the below message would appear on screen. 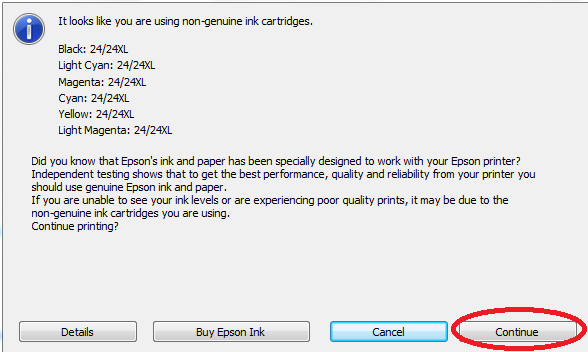 At this stage the print job should be cancelled by clicking ‘Cancel Print’, and the depleted cartridge should be changed. When any of the above messages appear on screen, the light on the printer resume button would be flashing, please see below. It is advised not to press this button, but instead to dismiss the popup message as described above. 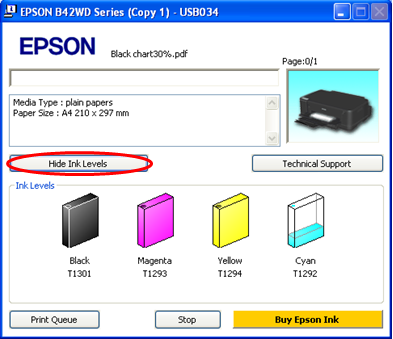 It is very important to note that the ink level indicator on the printer (if it has one) as well as the one in the printer driver on screen, does not show the correct level of ink in the cartridge. Please ignore the ink level indicator and keep using the cartridge until it has been physically depleted. On inserting an EBP HP950 or HP951 XL cartridge, the user may be presented with any of the following messages appearing on screen. It is advised not to press this button, but instead to dismiss the popup message as described above. However, in some instances the user in not given the option to dismiss the message on screen, as can be seen in the message below. 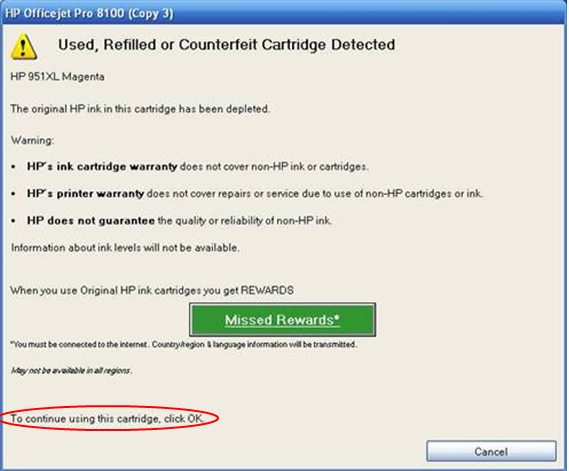 The message states 'To continue using this cartridge, click OK', circled in red above. But there is no 'OK' button to click. Press the flashing button on the printer. The printer should start/continue printing as expected. When the printing finishes, click the ‘Cancel’ button on the above message. It is critical to perform the two steps above in the correct order, and wait until the printer has finished the print job before clicking the ‘Cancel’ button on screen. The status shown is not the status of the cartridge you just inserted; just click “close” the window. 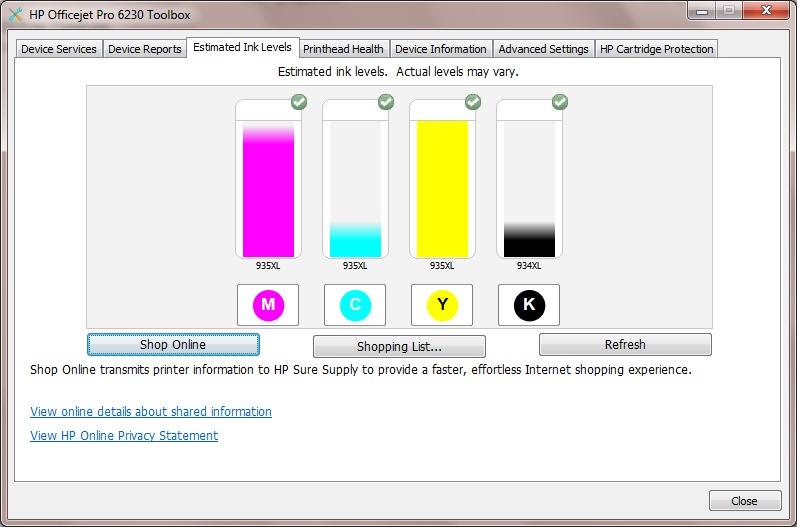 After repeat printing the ink level remains the same status. The status shown is not the status of the cartridge you just inserted; just click “close” the window. The user should dismiss any of these messages by clicking ‘OK’ or ‘No’. Please see circled in red below. On dismissing the ‘Used or Counterfeit Cartridge Detected’ message (please see below), the following message will appear on screen. Same as before this message should be dismissed by clicking the ‘OK’ button. 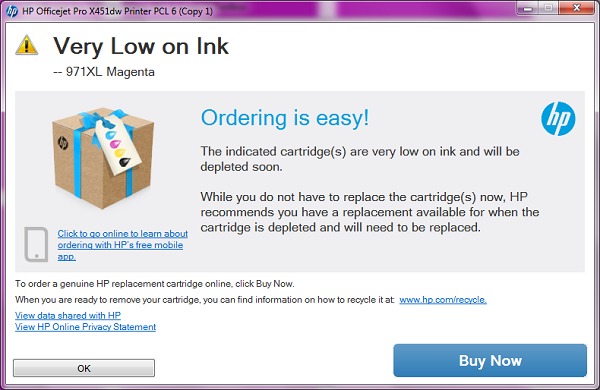 At any stage during the life of the cartridge, a ‘Low on Ink’ message may appear on screen. Same as before this message should be dismissed by clicking the ‘OK’ button. At any stage during the life of the cartridge, a ‘Low on Ink’ message may appear on screen. Please see below. 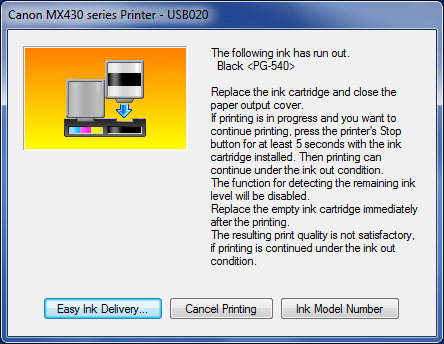 On installation of the PG-545XL cartridge in the printer, the below message will appear. By pressing “Start Printing” the printer will start to print. 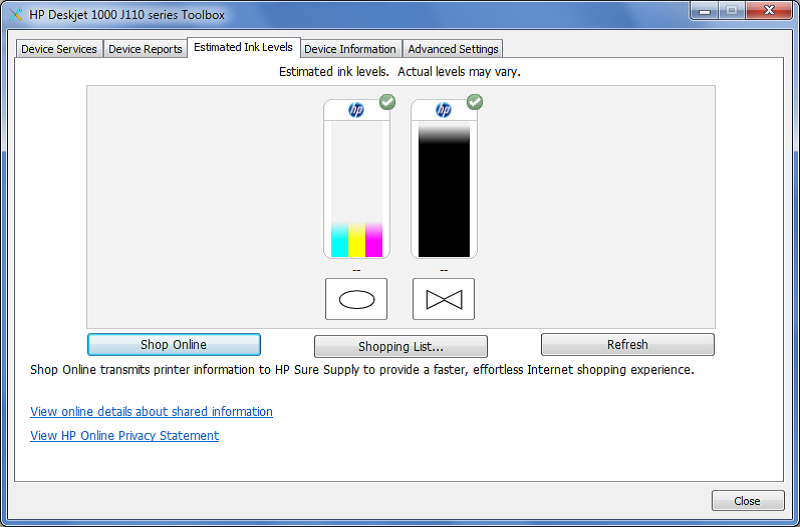 Once printing continues, the ink level indicator may appear as shown below. In this event, please ignore it as it does not show the true status of the cartridge. 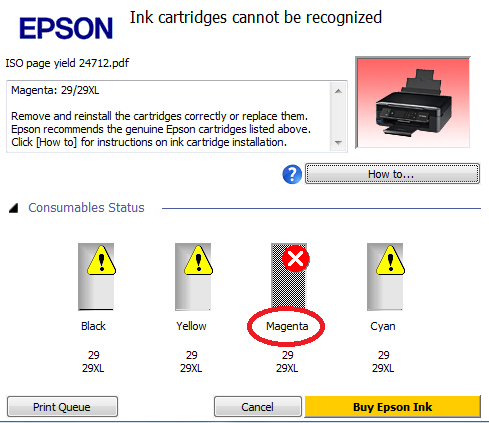 The two warning messages may appear indicating that the ink cartridge is empty. 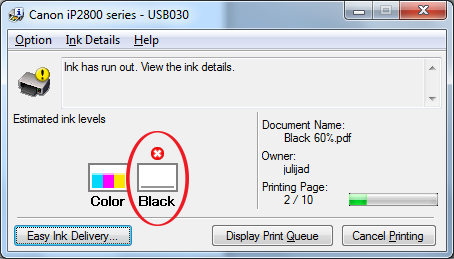 Simply follow the instructions on the screen to disable the ink level indicator (this message may vary depending on the printer model). By holding down the RESUME button for 5 seconds, the function for detecting the remaining ink will be disabled and printing will continue. 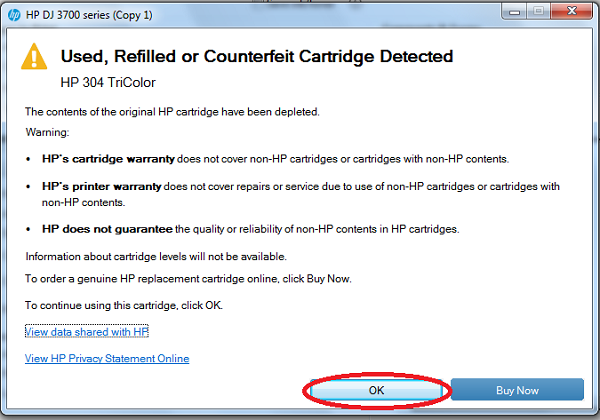 On installation of the CL-546XL cartridge in the printer, the below message will appear. 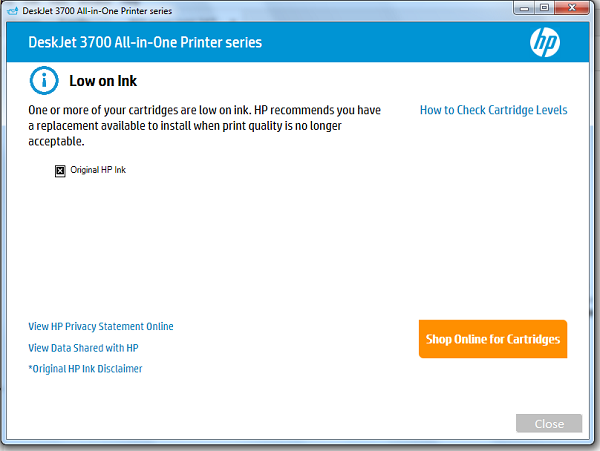 On installing the HP302XL cartridge the following message will appear. Please select ‘No’ and then the following message is likely to appear. Please select ‘OK’ after which the following message may appear. Please select ‘OK’ and continue printing as normal. 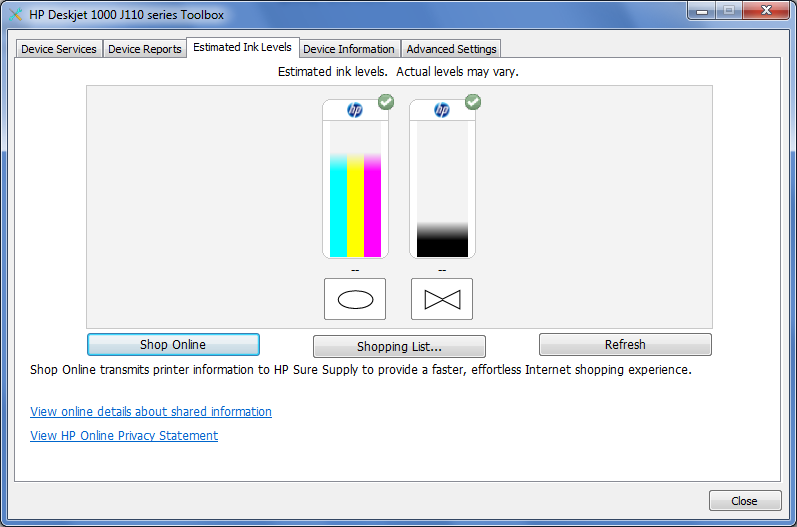 Please note the ink level status in the Printer Software is not the ink level of the cartridge and you can print normally until the cartridge is fully depleted of ink. 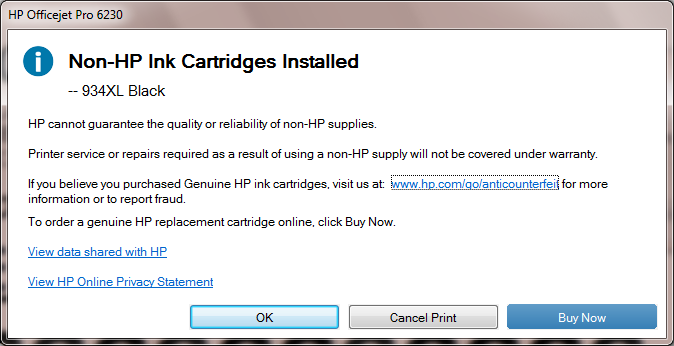 On installing the HP934XL cartridge the following message will appear. 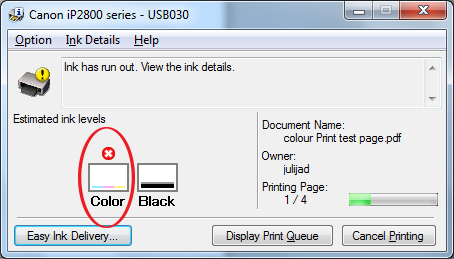 Please select ‘OK’ and continue printing as normal, the ink level will show as full. As you print and use the cartridge the ink level will deplete and at some stage the low ink warning messages will appear. 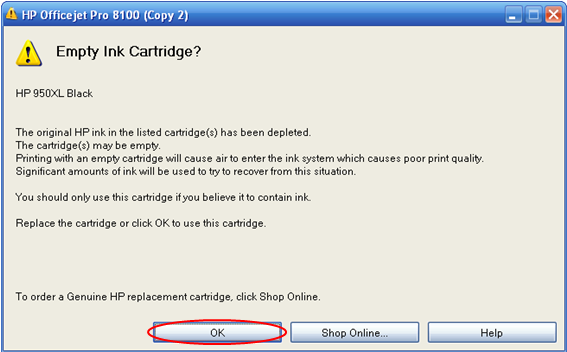 Please select ‘OK’ and continue printing until the ink has fully depleted at which point you have to change the cartridge. On installing the PGI-550 cartridge the following message will appear. The ink level will show as full. 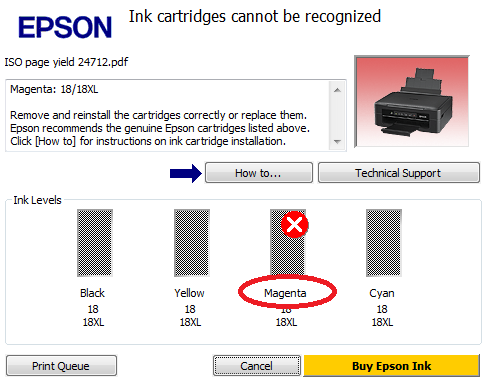 As you continue printing the ink level will start to deplete until a warning indicator can be seen advising the cartridge is almost out of ink. 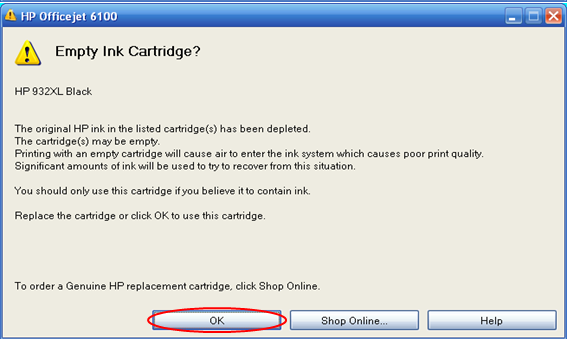 Once the ink has fully depleted the following message will appear advising that the cartridge has to be replaced. 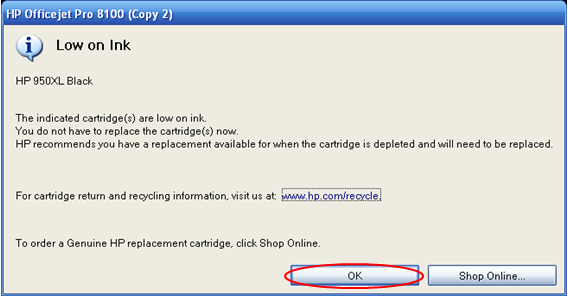 On installing the HP62XL cartridge the following message will appear. Please select ‘No’ after which the following message may appear. 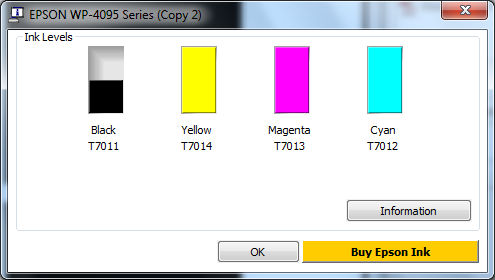 On installing the T7011 cartridge you will see the following pop up messages and the ink level will show full. Once the ink has been fully depleted the cartridge will need to be changed and the messages below will appear. 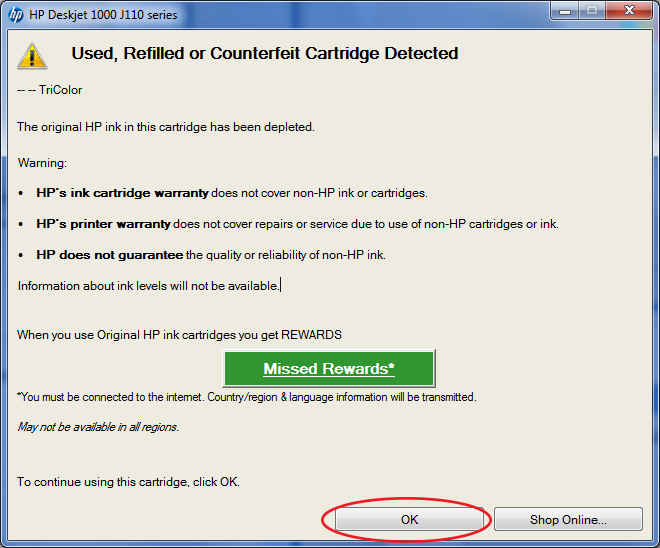 On installing a HP304 cartridge the following message will appear. 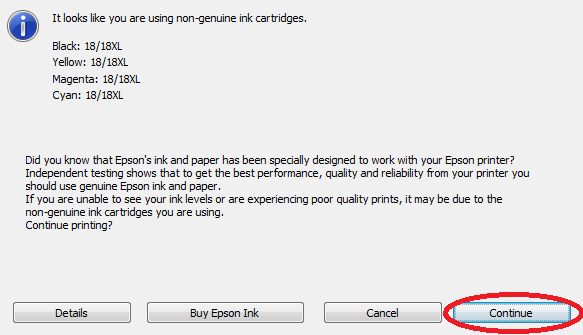 Please select ‘Continue’ and note the ink levels will not show but the cartridges are filled with ink. 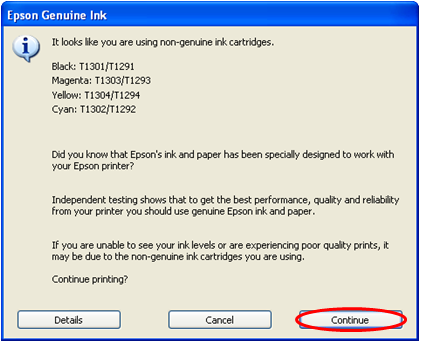 While printing, the cartridges start to deplete and messages will appear on the screen indicating low ink levels. 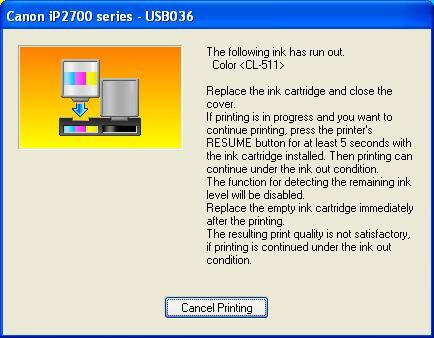 After this message please continue printing until you can visually see no ink is being printed on the paper, at which point the cartridge is likely to have depleted entirely and needs to be changed. The ink level will show full. 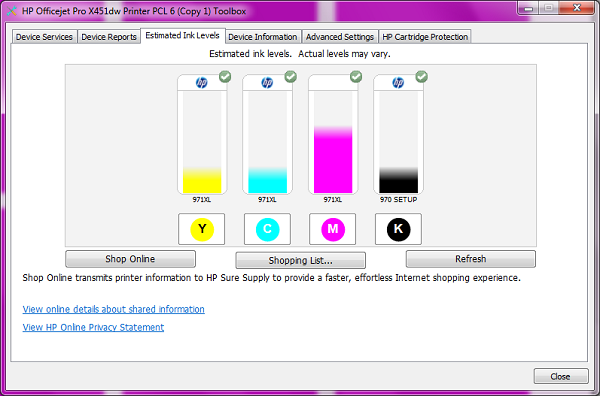 As you continue printing the ink levels start to reduce. Please select ‘OK’ and the printing will continue. 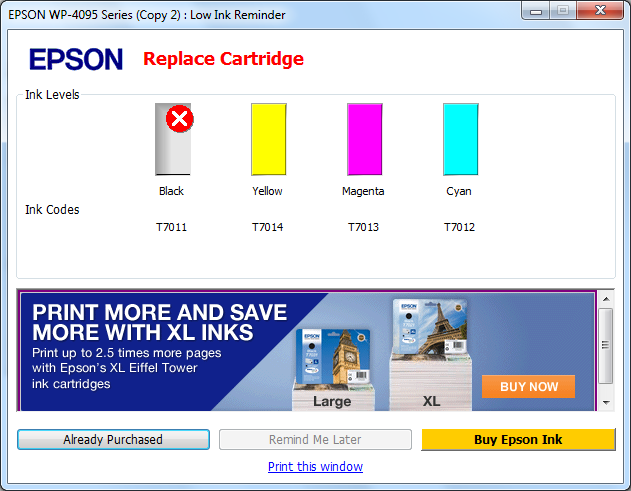 Once the cartridge has been depleted of ink the following message appears that the cartridge needs to be changed. On installing a T18 cartridge the following message will appear. Please select ‘Continue’ and the message will stop appearing. 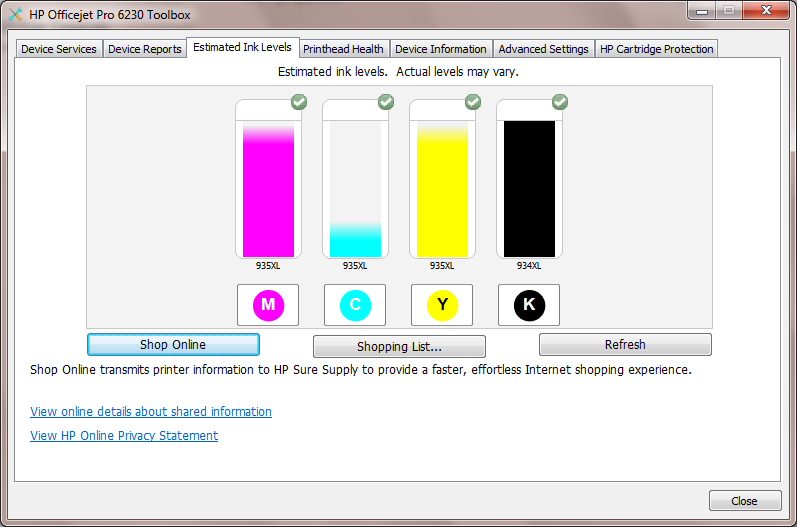 Printing will continue as normal and the ink level will show as full. 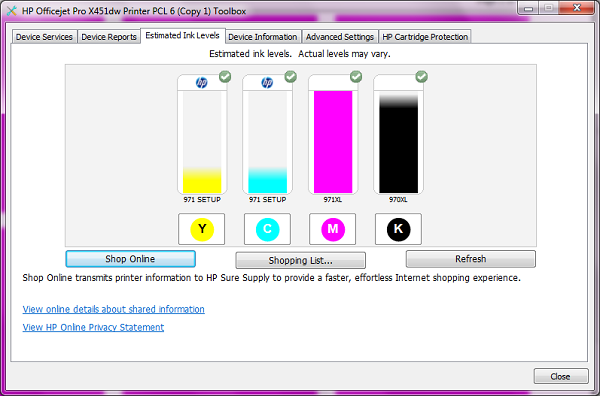 As you print and use the cartridge the ink level will deplete and at some stage the low ink warning messages will appear. 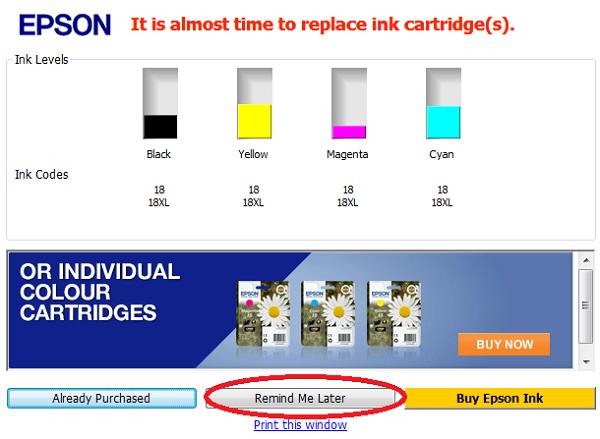 Please click ‘Remind Me Later’ and continue printing until the ink runs out. When a cartridge is depleted the following message is displayed and indicates the cartridge needs to be changed. On installing a T24 cartridge the following message will appear. On installing a T29 cartridge the following message will appear. The below messages are produced via the OEM Printer Manufacturer Firmware. 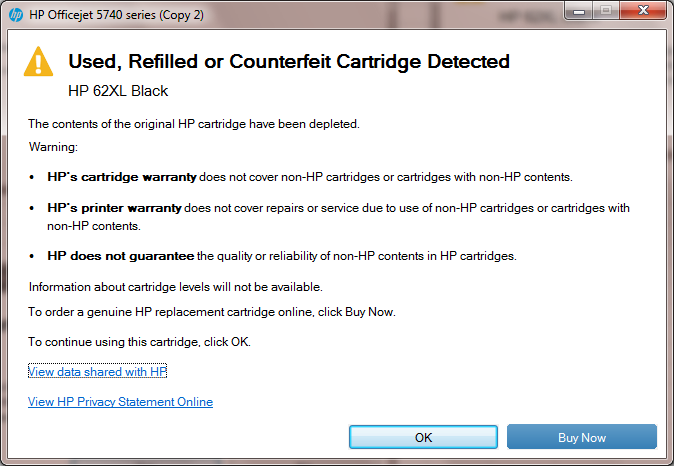 Regrettably these messages may prevent the Remanufactured cartridge you have purchased from operating correctly. 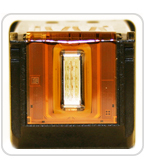 This is despite the cartridge being fully tested to total satisfaction in a printer suitable for this cartridge during the remanufacturing process. 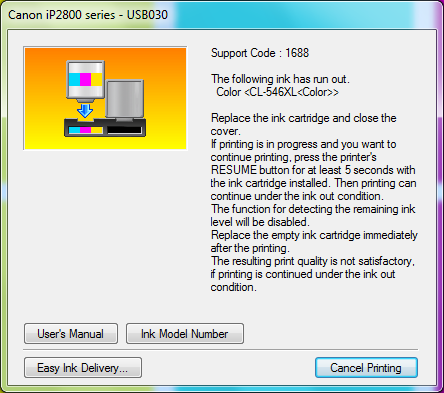 In some instances your Printer Firmware may recently have been updated via a ‘Firmware Update’ (this can be done automatically without your knowledge), which may result in these messages appearing mid-way through the cartridge life cycle rendering the cartridge unable to be used any further, despite its full capability to do so. In other instances, the electronic circuitry may have failed due to other unknown reasons. We apologise for any inconvenience caused and trust that this will not deter you from using Remanufactured cartridges in the future as this type of occurrence is very infrequent.